In 1991, at the suggestion of her editor (Osabu), Naoko Takeuchi writes a one-shot manga story about a middle school girl who transforms into a sailor-suited superheroine. - She gives her heroine a talking cat sidekick named Artemis (after the Roman goddess of the moon) who has a crescent moon mark on his forehead. - She likewise gives her heroine (post-transformation) a crescent moon mark on her forehead, and features crescent moons on her choker, gloves, and shoes. - She equips her heroine with a crescent moon-shaped compact that must be kept charged by moonlight. - She has her heroine use this compact to attack with "Mikadzuki (Crescent) Boomerang" and "Crescent Beam." - She has her heroine also use this compact to disguise herself with "Mikadzuki (Crescent Moon) Power Transform!" - She gives her heroine a transformation pen that bears a crescent moon, and which she uses to transform into her superheroine identity by calling out "Moon Power Transform!" And what does she call this heroine? My question is: WHY? If Naoko was so determined to create a superheroine with a lunar motif, why not call her "Sailor Moon" from the beginning? Or, if she did want to create a superheroine named "Sailor Venus," why not use Venus symbols and heart motifs? Is there any rational explanation for this, or is this just another example of Naoko being a weirdo? I thought she called Sailor V because Victory and came up with Venus later on after she decided to go with Sailor Moon. She then used Sailor v having moon aspects as a plot point of Minako pretending she's a princess. Even in the original one-shot, she's identified as "Sailor Venus", using "Sailor V" as a (superfluous) codename. Hmmm she did swap Pluto and Saturn motifs (Chronos is iidentified with Saturn) so maybe she thought its unique that way? Venus has phases just like the Moon. The Crescent’s can be explained that the planet Venus also has phases like the moon, but you’re right that naming the cat Artemis and the transformation phrase explicitly referencing the moon makes little sense. According to Naoko, she didn’t really have much of a story planned for Sailor V. Osano and her also cobbled together a plot outline when Toei approached them about turning it into a full series. I think the mixed motifs came with the fact that Sailor V was really the only planned character at the time. If Naoko knew in advance she’d develop a full team including a character named Sailor Moon, I think she’d avoid the moon references for V.
I think she wanted to expand the story from the beginning, while not really telling anyone. 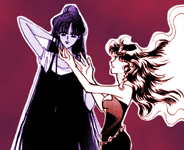 Venus and Moon were always played as being "two sides of the same coin", both in the manga and anime (mostly through gags). I think originally Naoko just really liked the motif and actually had the idea of naming her Sailor Moon, but changed it once she realized she could big a bigger story out of it. As I mentioned Venus and Moon are really similar in a sense, so having a crescent motif on Venus makes sense while having it with Mercury would just throw off her image. Then of course, Naoko does the inverse beginning in the Infinity arc, where suddenly all of Sailor Moon's imagery becomes heart-themed (a motif that should logically belong to Venus): she gets a heart shaped compact, she has a heart on her choker, she gets a new scepter with a giant heart on it, her attacks include the word "Heart" in them... So I definitely agree that Moon and Venus are "two sides of the same coin" as you say. But I still find it strange that Naoko didn't just start off with Sailor Moon to begin with. Actually she didn't swap their motifs. Saturn or Cronus as a deity was associated with creation and dissolution aka life and death especially with regards to agriculture. Chronos is actually a primordial God of Time who was originally separate from the Titan Cronus. Pluto aka Hades did have death associations as well but it was stated that the Underworld was a place beyond time which is why in many Greek plays that are narrated by the dead because they like the Gods live beyond time. To be perfectly honest Cronus's powers overlap with quite a few of his children. He was associated with the Heavens and Divine rulership like his children Zeus and Hera. He was associated with agriculture like his daughter Demeter and with creation and dissolution and he had associations with death like his child Hades. In fact later on Cronus reconciled with Zeus and was given rulership over the Elysion fields which was basically the Heaven of ancient Greek belief. Also as for Minako I believe the over all Lunar symbolism came from Minako masquerading as the Moon Princess. This also might stem from astrology as Venus was sometimes said to mimic the Moon. I mean.... I think the "Venus's masquerading as the Moon Princess" stuff was just a way for Naoko to retroactively make sense of the lunar motifs she had bestowed upon Minako/Sailor V... I don't think she had any inkling of that subplot when she wrote the original one-shot. But while we're on the subject... What exactly is the (in-universe) rationale behind Minako/Venus posing as the Moon Princess? I guess it was so that she would be the target and not say Usagi or that she would lead them till Usagi realized she was the Moon Princess. 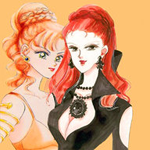 Perhaps there was a greater production gap between Naoko's initial conception of Sailor V and the first release of the Sailor V manga one-shot, during which time she created the character with her moon-themed motif but hadn't yet applied the Venus name, and by the time of the one-shot's release the plan to create the separate Sailor Moon series and use Minako's series as a prequel of sort may have come about. In other word, Naoko may have originally intended to have Minako as the moon-themed hero instead, but after she got Minako's one-shot approved for a series and before it got finalized for publication, Toei might have taken notice of the one-shot and begin talks with Naoko about turning it into a five-girl superhero team series, with the end result being that the series that would become Sailor V would be released as a separate series to what would become the main "Sailor Moon" manga and anime series, necessitating that the main heroine of the more prominent series be the moon-themed hero in both motif and name, while the moon-themed heroine of the lesser series would instead be given the name "Sailor Venus" to help tie her in to the main series without conflicting to much with Usagi's being Sailor Moon. 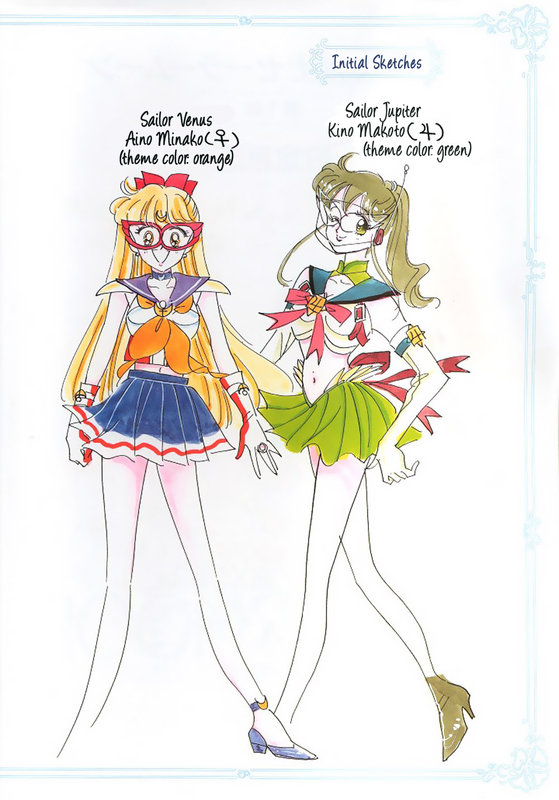 Thus, after all this was decided, it's possible that Sailor V saw release with only Minako's hero name changed but not her moon motif since it would have been too much trouble to go back and redraw all of her moon-themed stuff as Venus-themed stuff. So they just left it all in as something to tie her in with the Sailor Moon series while still being her own character before she gets her properly-named-and-themed "Sailor Venus" form. I think the "Venus's masquerading as the Moon Princess" stuff was just a way for Naoko to retroactively make sense of the lunar motifs she had bestowed upon Minako/Sailor V... I don't think she had any inkling of that subplot when she wrote the original one-shot. Of course. For me the answer is clear. It's because Naoko wanted to include the elements of the moon and beauty into one character. She did it for the aesthetics and the "shojo-ness", accuracy and consistency be damned. She was fascinated with moon imagery but also wanted her protagonist to be associated with the goddess of love and beauty and so she meshed the two together. Then when Sailor Moon happened she tried to course-correct by making up that flimsy subplot. Planning ahead and world-building was never Naoko's strong suit. Too bad she didn't do a better job of balancing the two aspects. If only she'd come up with Sailor Venus's "prototype" design to begin with; the blended Venus symbols/crescent moons make more sense to me. "passionate" artist, she's more driven by emotion than though. Meaning that, when it comes to creating, she'd rather make something she feels better with, even if it doesn't follow a strict logic. Yeah this is a problem I have with her work. She can be an amazing writer but at other times she will go against logic and even the established plot sometimes if she likes the way something feels better. I'm not a huge fan of her writing to begin with. A good theory but this is very unlikely because Toei only approached Naoko after the Sailor V one shot was published in RunRun and if anything Naoko was more attached to the name of Sailor V/Sailor Venus considering what ended up becoming Bishoujo Senshi Sailor Moon was originally supposed to be called Bishoujo Senshi Sailor V. The Sailor Moon name came afterwards. Hmm. Then, yeah, her giving a Venus-named heroine a bunch of moon-themed stuff is weird. Unless she just intended the moon motif to be a generalized "space" motif, and thought that "moon" would be more appealing/marketable/etc. than "space" would be.